The eruption of Mount Pinatubo in the Philippines in 1991 was the second-largest volcanic eruption of the 20th century (after Katmai in Alaska in 1912). It offers many lessons in volcanic prediction, warning, evacuation, and resettlement that may serve as lessons for future eruptions around the world. Pinatubo offers reassuring evidence that careful volcanic monitoring can lead to public warnings and evacuations that can save thousands of lives during catastrophic volcanic eruptions. Mount Pinatubo is located on the Philippine island of Luzon, about 50 miles (80 km) northwest of Manila and close to what was the u.S. Clark Air Force Base. Before 1991 Mount Pinatubo was known to be a volcano but was not thought to pose much of a threat since it had not erupted for approximately 500 years. About half a million people lived on or near the volcano, including some 16,000 American citizens stationed at Clark Air Force Base. As soon as Pinatubo began to show signs of activity, Philippine and U.S. Geological Survey personnel set up volcano-monitoring stations and equipment, providing detailed and constantly updated evaluations of the status of the volcano and the potential danger levels and likelihood of an impending eruption. Geologists coordinated efforts with local military, civil defense, and disaster-planning officials and quickly worked on determining the volcanic history and mapping areas the most at risk. Critically important was examining the past eruption history to determine how violent past eruptions had been, as an indicator about how bad any impending eruption could be. What the geologists found was frightening, as they determined that Pinatubo had a history of producing tremendous, extremely explosive eruptions, and that such an event might be in the making for the period of activity they were examining. They did not have long to realize their fears. Precursors to the giant eruption of Pinatubo in June 1991 may have been initiated by a large earthquake on July 16, 1990, centered about 60 miles (100 km) northeast of Pinatubo. This earthquake may have somehow started a series of events that allowed magma to rise beneath the volcano, perhaps opening cracks and fissures beneath the volcano. Soon after this local villagers (known as the Aetas, a seminomadic people who had lived on the volcano for about 400 years, since they fled to the area to hide from conquering Spaniards) reported activity on the mountain, including low rumbling sounds, landslides near the summit, and steam eruptions from fissures. Seismologists measured five small earthquakes around Pinatubo in the next several weeks, but activity seemed to quiet for half a dozen months after the initial swarm of activity. The first major steam eruption from Pinatubo was observed by villagers, who reported a mile-long (1.6-km) fissure exploding and emitting ash from the north side of the volcano on April 2, 1991. Ash covered surrounding villages, prompting the Philippine Institute of Volcanology and Seismology (PHI-VOLCS) and military and civil defense authorities to set up a series of seismographs around the volcano, which recorded more than 200 earthquakes the next day. Authorities declared a volcanic emergency, recommending that villagers within six miles (10 km) of the summit be evacuated. Volcano experts from the U.S. Geological Survey joined the observation and monitoring team on April 23, bringing a plethora of monitoring equipment with them. The local and American teams set up a joint volcano-monitoring observatory at Clark Air force base, where they also monitored seven seismic stations placed around the volcano. By the middle of May the Pinatubo Volcano Observatory was recording 30-180 earthquakes a day—at the same time that geologists were scrambling to complete field work to understand the past eruptive behavior of the mountain. The geologists determined that the volcanic basement to the modern peak was about a million years old and that the mountain itself had been built by about six major violent eruptions in the past 35,000 years. They determined that the eruptions were becoming slightly less violent with time but more frequent, with the last major eruption about 500 years ago. The mountain was overdue for a large, violent eruption. on May 13 volcanologists measured emissions of sulfur dioxide gas, an indicator that molten rock (magma) at depth was rising beneath the volcano. In consultation with the volcano observatory scientists, civil defense authorities issued a series of levels of alerts to warn the public in the event of a catastrophic eruption. These alert levels were updated several times per day, and geologists published new hazard maps showing locations where mudflows, lahars, ash falls, and nuées ardentes were the most likely to occur during an eruption. Thousands of small earthquakes and greater amounts of sulfur dioxide indicated that magma was still rising beneath the volcano in May, with estimates showing that the magma had risen to within 1.2-4 miles (2-6 km) beneath the surface of the volcano. It was difficult to interpret the warning signs of the impending eruption and to determine whether and when it might occur. The geologists and government officials were torn between ordering immediate evacuations to save perhaps hundreds of thousands of lives, or letting villagers stay until the danger grew more imminent so they could harvest their fields. On June 1 many of the earthquakes became concentrated in one area beneath a steam vent on the northwest side of the summit, which began to bulge outward. On June 3 the volcano began to spew a series of ash eruptions, which continued to increase such that the volcanic alert level was raised to level three (meaning an eruption was possible within two weeks). About 10,000 villagers were evacuated, and on June 7, the volcano had a minor eruption that sent ash and steam to a height of about five miles (8 km) above the summit. The volcano was bulging more, and there were more than 1,500 earthquakes per day, raising the alert level to four (eruption possible within 24 hours), and the evacuation zone was doubled in distance from the volcano. June 7 saw a small magma dome oozing out of the volcano about half a mile northwest of its peak, the first sign that magma had reached the surface. Two days later large amounts of sulfur dioxide began to escape again (after having stopped for several weeks), and small nuées ardentes began to tumble down the slopes of the volcano. The volcanic alert was raised to level five—eruption in progress—and massive evacuations began. The ash eruptions grew larger, and on June 10, all aircraft and 14,500 U.S. personnel from Clark Air Force Base left for safer ground at nearby Subic Bay Naval Base, leaving only 1,500 American personnel and three helicopters on the air force base. At 8:51 a.m. on June 12 the mountain sent huge columns of hot ash surging to 12 miles (20 km) high in the atmosphere, spawning nuées ardentes that covered some now-evacuated villages. Skies became dark and everything for miles around began to be covered with ash. The evacuation radius was increased to 18 miles (30 km) from the volcano, with the numbers of evacuated now reaching approximately 73,000. Eruptions continued, and on June 13, another huge explosion sent ash past 15 miles (25 km) into the atmosphere. Then the volcano became ominously quiet. Another large eruption broke the silence at 1:09 p.m., followed quickly by a series of 13 more blasts over the next day. Nuées ardentes roared through several more evacuated villages, burying them in hot ash, while typhoon Yunya pelted the area and added wind and rain to the ash, making a miserable mixture. Ash covered the entire region of a thousand square miles. Ash and pumice began falling heavily on Clark Air Force base, and the remaining staff from the volcano observatory fled to a nearby college. As the scientists were leaving the observatory at Clark, the eruption style changed dramatically for the worse, rapidly moving into the realm of giant eruptions and becoming the second-largest eruption in the world in the 20th century. The cataclysmic eruption continued for more than 9 hours, and during this time more than 90 percent of the material erupted during the whole cycle was blasted into the air. Huge, billowing Plinian ash columns passed 21 miles (34 km) in height and spread across 250 square miles (1,000 km2). The top of the volcano began to collapse into the empty magma chamber, prompting fears of a truly catastrophic eruption that luckily proved unfounded. The magma was largely drained, and the top of the volcano collapsed into empty space, forming a large caldera whose summit lies 870 feet (265 m) below the former height of 5,724 feet (1,745 m) of the volcano. Ash, nuées ardentes, and lahar deposits hundreds of feet thick filled the valleys draining the flanks of Pinatubo, and thick ash covered buildings across an area of more than 210,000 square miles (340,000 km2). Approximately five to six cubic miles (20-25 km3) of volcanic material was blasted from Pinatubo, along with more than 17 megatons of sulfur dioxide 3-16 megatons of chlorine, and upwards of 420,234 megatons of carbon dioxide. The devastation was remarkable, with buildings wiped away by nuées ardentes and mudflows, and others collapsed by the weight of wet ash on their roofs. Crops were destroyed and roads and canals impassable. Ash covered much of Luzon and fell across the South China Sea, while much ash remained in the atmosphere for more than a year afterward. Smaller eruptions continued, decreasing in frequency through July to about one per day by the end of August, stopping completely on September 4. A new lava dome rose in the caldera a year later in July 1992, but no large eruption ensued. Only between 200 and 300 people died in the initial eruption, although more were to die later in mudflows and other events, bringing the death toll to 1,202. Most of the initial deaths were people who took shelter in buildings whose roofs collapsed under the weight of the rain-soaked volcanic ash. The well-documented atmospheric effects of the Pinatubo event clearly show the climatic effects of large volcanic eruptions. The gas cloud from Pina-tubo, formed from the combination of ash, water, and sulfur dioxide, was the largest cloud of sulfu-ric acid aerosol since that produced by Krakatau in 1883. This sulfuric acid aerosol eventually reached the ozone layer, where it destroyed huge quantities of ozone and greatly increased the size of the ozone hole over Antarctica. In only three weeks the sulfuric acid cloud spread around the world between 10°S and 30°N latitudes, dropping global temperatures by up to one-half to one degree C and causing spectacular sunsets. The cloud remained detectable in the atmosphere until the end of 1993. Many unusual weather patterns have been attributed to the global lowering of temperatures by the Pinatubo cloud, including colder, wetter, and stormier winters in many locations. Most of the evacuated villagers lost livestock, homes, and crops, but they survived because of the well-timed warnings and prompt, responsible evacuations by government officials. Conditions in the refugee camps were not ideal, however, and about 350 additional deaths occurred after the eruption from measles, diarrhea, and respiratory infections. The rainy season was approaching, and many mudflows began sweeping down the flanks of the volcano at 20 miles per hour (30 km/hr), then spread across once lush farmland. Hundreds of mudflows were recorded on the eastern flank of the volcano in the last few (rainy) months of 1993, killing another 100 people in 1993 and continued to do so every year after, though with fewer deaths. Mudflow warning systems and alert levels were set up, saving many additional lives in succeeding years. Economic losses from the eruption of Pinatubo were tremendous, stunting the Philippine economy. Damage to crops and property amounted to $443 million by 1992, with $100 million more spent on refugees and another $150 million on mudflow controls. Eight thousand homes were destroyed, and 650,000 lost jobs for at least several months. The U.S. air and naval bases at Clark and Subic Bay both closed, causing additional job losses in the region. Mount Pinatubo provided valuable information to geologists and atmospheric scientists about the amount and types of volcanic gases injected into the atmosphere during volcanic eruptions and the effects of these gases on climate and the environment. Most gases in the atmosphere are volcanic in origin, so volcanoes have had a direct link to climate and human activities over geologic time. The relative importance of the release of volcanic gases by volcanoes versus the emission of greenhouse gases by humans in climate change is currently a hotly debated topic. If volcanoes can produce more aerosols and gases in a few days or weeks than humans produce in years, then volcanic eruptions may drastically change the rates of climate change that are produced by natural cycles and human-related emissions. Gases released from Mount Pinatubo produced an average global cooling around the planet, yet they were also associated with winter warming over the Northern Hemisphere continents for two years following the eruption. These unexpected effects resulted from complex differences in the way the aerosols were distributed in the stratosphere in different places. Aerosol heating in the lower stratosphere combined with a depletion of ozone to contribute to local warming in the Northern Hemisphere winters. The average atmospheric cooling has also been implicated in some biological responses to the volcanic eruption. Coral reefs are very sensitive to small variations in temperature, and after the eruption of Pinatubo coral reefs in the Red Sea saw a massive die-off that was probably related to the atmospheric cooling. The gases in the atmosphere also caused incoming solar radiation to be more diffuse, which led to greater vegetation growth. These additional plants in turn drew a greater amount of carbon dioxide from the atmosphere, further cooling the planet. It has also been hypothesized that Northern Hemisphere winter warming led to a spike in the number of polar bear cubs born the following spring. Most observations and models for atmospheric evolution following massive eruptions show that the aerosol and ozone levels recover to pre-eruption levels within five to 10 years after the eruption. See also convergent plate margin processes; magma; plate tectonics; tsunami, historical accounts; volcano. 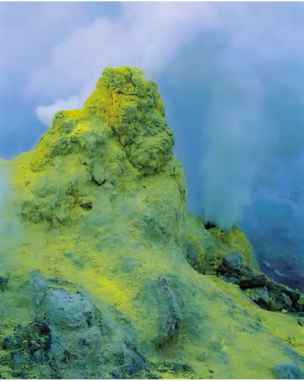 Blong, Russel J. Volcanic Hazards: A Sourcebook on the Effects of Eruptions. New York: Academic Press, 1984. Fisher, R. V. Out of the Crater: Chronicles of a Volcanolo-gist. Princeton, N.J.: Princeton University Press, 2000. Fisher, R. V., G. Heiken, and J. B. Hulen. Volcanoes: Crucibles of Change. Princeton, N.J.: Princeton University Press, 1998. Oregon Space Grant Consortium. "Volcanoworld." Available online. URL: http://volcano.oregonstate.edu/. Accessed October 10, 2008. Scarpa, Roberto, and Robert I. Tilling. Monitoring and Mitigation of Volcano Hazards. New York: Springer, 1996. Simkin, T., and R. S. Fiske. Krakatau 1883: The Volcanic Eruption and Its Effects. Washington, D.C.: Smithsonian Institution Press, 1993. U.S. Geological Survey. Volcano Hazards Program home page. Available online. URL: http://volcanoes.usgs. gov/. Accessed September 11, 2008; data updated daily or more frequently. 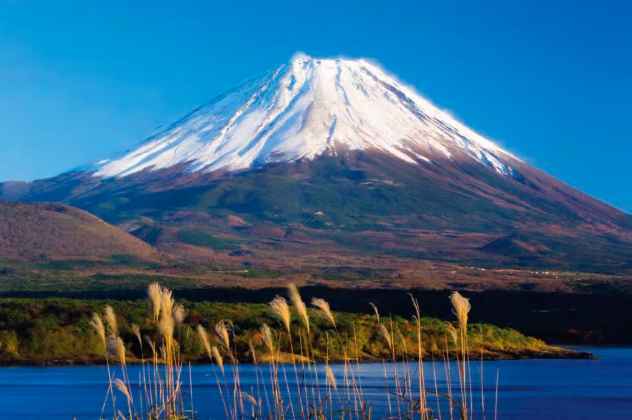 Japan Japan is an island arc and subduction zone trench system that rests as a sliver of the North American plate above the Pacific plate outboard of the Eurasian plate. 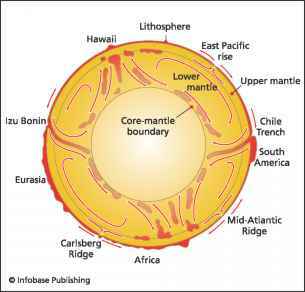 This tectonic scenario has existed since mid-Tertiary times. From the beginning of the Phanerozoic to the Tertiary, Japan was part of the Eurasian continental margin and was involved in interactions between Eurasia and the Tethys and Panthalassic Oceans. A few occurrences of middle Paleozoic rocks are known from Japan, but the vast majority of strata are younger than middle Paleozoic. Most of the rocks are aligned in strongly deformed structural belts that parallel the coast for 1,850 miles (3,000 km) and include fos-siliferous marine strata, weakly to strongly metamorphosed pelitic to psammitic rocks, and granitic intrusions. Since most rocks are strongly deformed in fold-thrust belt structures, one can infer that the more strongly metamorphosed units have been uplifted from deeper in the arc-accretionary wedge system or metamorphosed near the plutons. The complexly deformed zones are overlain by little-deformed Mesozoic-Cenozoic nonmarine to shallow-marine basin deposits. In addition abundant Tertiary volcanic and volcaniclastic deposits are present along the western side of the islands and in the Fossa Magna in central Honshu Island. become exhumed and exposed at the surface in the high-pressure low-temperature belt. Blueschist facies rocks containing the diagnostic mineral galucophane, formed with pressures greater than four kilobars and temperatures between 390°-840°F (200°-450°C), are common. The adjacent Ryoke-Abukuma belt contains low-pressure high-temperature, as well as medium-pressure, high-temperature metamorphic rocks. These metamorphic rocks form near the axis of the arc in close association with subduction-derived magmas. Since the rocks in this belt form over a considerable crustal thickness and are associated with many high-temperature magmas, they were metamorphosed at a range of pressures and generally high temperatures. A number of other paired metamorphic belts have been recognized throughout the world. In the western United States the Franciscan complex contains rocks metamorphosed at high pressures and low temperatures, whereas rocks in the Sierra Nevada and Klamath Mountains contain high-temperature, low-pressure metamorphic facies. Other paired meta-morphic belts are recognized in Alaska, New Zealand, Indonesia, Chile, Jamaica, and the European Alps. See also convergent margin processes; island arcs, historical eruptions; metamor-phism and metamorphic rocks. Springer, 1991. Miyashiro, Akiho. Metamorphism and Metamorphic Belts. London: Allen and Unwin, 1979. Jupiter The fifth planet from the Sun, Jupiter is the gaseous giant of the solar system, named after the most powerful Roman god of the pantheon. It has more than twice the mass of all the other planets combined, estimated at 1.9 x 1027 kilograms, or 318 Earth masses, and a radius of 44,268 miles (71,400 km), or 11.2 Earth radii. 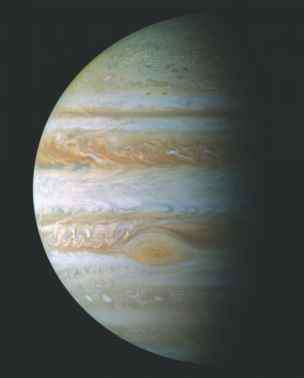 Volumetrically it would take 1,400 Earths to fill the space occupied by Jupiter. Jupiter is the third-brightest object in the night sky, following the Moon and Venus. Four of its many moons are visible from the Earth. orbiting the Sun at a distance of 483 million miles (778 million km, at its semimajor axis), Jupiter takes 11.9 Earth years to complete each orbit. Visual observations of the surface of Jupiter indicate that the gaseous surface has a rapid differential rotation rate, with the equatorial zones rotating with a period of nine hours and 50 minutes, and higher latitudes rotating with a period of nine hours and 56 minutes. The interior of the planet is thought to be rotating with a period of nine hours 56 minutes, since the magnetic field rotates at this rapid rate. The rapid rotation has distorted the planet so that the equatorial radius (44,365 miles, or 71,400 km) is 6.5 percent greater than the polar radius (41,500 miles, or 66,800 km). The outer layer of Jupiter is made of gases, with temperatures at the top of the cloud layers estimated to be -127°F (-88°C; 185 k) and a pressure of 10 bars. This is underlain by a layer of molecular hydrogen extending to 12,425 miles (20,000 km) below the surface. The temperature at this depth is estimated to be 19,340°F (11,000°K), with 4 Megabars pressure. Below this a layer of metallic hydrogen extends to 37,280 miles (60,000 km), with basal temperatures of 44,540°F (25,000°K), and 12 megabars pressure. An internal rocky core extends another 6,215 miles (10,000 km). Jupiter's surface and atmosphere is visibly dominated by constantly changing colorful bands extending parallel to the equator, and a great red spot, which is a huge, hurricane-like storm. The bands include yellows, blues, browns, tans, and reds, thought to be caused by chemical compounds at different levels of the atmosphere. The most abundant gas in the atmosphere is molecular hydrogen (86.1 percent), followed by helium (13.8 percent). 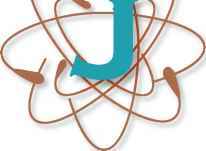 other chemical elements such as carbon, nitrogen, and oxygen are chemically mixed with helium. Hydrogen is so abundant on Jupiter because the gravitational attraction of the planet is sufficiently large to retain hydrogen, and most of the planet's original atmosphere has been retained. tens of years. Many similar features are found elsewhere on the planet. Jupiter has many moons, with the Galilean satellites resembling a miniature solar system. The four largest moons include Io (1.22 Earth/Moon masses), Europa (0.65 Earth/Moon masses), Ganymede (2.02 Earth/Moon masses), and Callisto (1.47 Earth/Moon masses). Each moon is distinct and fascinating, showing different effects of the gravitational attraction of nearby Jupiter. Io and Europa are rocky, planetlike bodies, with Io exhibiting active sulfur-rich volca-nism and very young surface material. The energy for the volcanism is thought to be the gravitational attraction of Jupiter, and the sulfur particles emitted from the volcanoes get entrained as charged ions in Jupiter's magnetosphere, forming a plasma torus ring around the planet. Europa has an icy surface with a rocky interior, criss-crossed by cracks on the surface that may be analogous to pressure ridges on terrestrial ice flows. Because the surface does not contain many craters, it must be relatively young. Ganymede and Callisto are icy satellites with low densities, and Ganymede's heavily cratered surface implies maturity. Callisto also has many craters, including two huge ones with multiple rings, reflecting cataclysmic impacts in its history. See also Earth; Mars; Mercury; Neptune; Saturn; solar system; Uranus; Venus. Chaisson, Eric, and Steve McMillan. 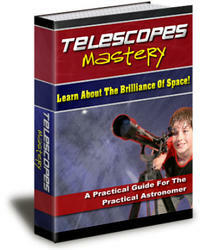 Astronomy Today. 6th ed. Upper Saddle River, N.J.: Addison-Wesley, 2007. York: W. H. Freeman, 2008. National Aeronautic and Space Administration. Solar System Exploration Page. "Jupiter." Available online. URL: http://solarsystem.nasa.gov/planets/profile. cfm?Object=Jupiter. Accessed June 25, 2008. Snow, Theodore P. Essentials of the Dynamic Universe: An Introduction to Astronomy. 4th ed. St. Paul, Minn.: West, 1991.
karst Areas affected by groundwater dissolution, cave complexes, and sinkhole development are called karst terrains. Globally, several regions are known for spectacular karst systems, including the cave systems of the Caucasus, southern Arabia including Oman and Yemen, Borneo, and the mature, highly eroded karst terrain of southern China's Guangxi Province. Caves are defined as underground openings and passageways in rock that are larger than individual spaces between the constituent grains of the rock. The term is often reserved for spaces large enough for humans to enter. Many caves are small pockets along enlarged or widened cavities, whereas others are huge open underground spaces. The largest cave in the world is the Sarawak Chamber in Borneo, with a volume of 65 million cubic feet (1.84 million m3). The Majlis Al Jinn (Khoshilat Maqan-deli) Cave in Oman is the second-largest known cave and is big enough to hold several of the sultan of Oman's royal palaces, with a 747 flying overhead (for a few seconds). Its main chamber is more than 13 million cubic feet (370,000 m3), larger than the biggest pyramid at Giza. Other large caves include the world's third-, fourth-, and fifth-largest caves, the Belize Chamber, Salle de la Verna, and the largest "Big Room" of Carlsbad Cavern, a chamber 4,000 feet (1,200 m) long, 625 feet (190 m) wide, and 325 feet (100 m) high. Each of these has a volume of at least 3 million cubic feet (85,000 m3). Some caves form networks of linked passages that extend for many miles. Mammoth Cave, Kentucky, for instance, has at least 300 miles (485 km) of interconnected passageways. While the caves are forming, water flows through these passageways in underground stream networks. The formation of karst topography begins with dissolution. Rainwater that filters through soil and rock works into natural fractures or breaks in the rock, and chemical reactions that remove ions from the limestone slowly dissolve and carry away parts of the limestone in solution. Fractures gradually enlarge, and groundwater flowing in underground stream networks through the rock creates new passageways. Dissolution of rocks is most effective if the rocks are limestone and if the water is slightly acidic (acid rain greatly helps cave formation). Carbonic acid (H2CO3) in rainwater reacts with the limestone, rapidly (at typical rates of a fraction of an inch, or a few millimeters per thousand years) creating open spaces, cave and tunnel systems, and interconnected underground stream networks. When the initial openings become wider, they are known as caves. Many caves are small pockets along enlarged or widened cavities, whereas others are huge, open, underground spaces. In many parts of the world the formation of underground cave systems has led to parts of the surface collapsing into the caverns and tunnels, forming a distinctive type of topography known as karst topography. Karst is named after the Kars Limestone plateau region in Serbia, Bosnia, and Croatia (the southeast part of the former Yugoslavia), where it is especially well developed. Karst topography takes on many forms in different stages of landscape evolution but typically begins with the formation of circular pits on the surface known as sinkholes. These form when the roof of an underground cave or chamber suddenly collapses, bringing everything on the surface suddenly down into the depths of the cave. Striking examples of sinkhole formation surprised residents of Orlando, Florida, in 1981 when a series of sinkholes swallowed many businesses and homes with little warning. In this and many other examples sinkhole formation is initiated after a prolonged drought or drop in groundwater levels. This drains the water from underground cave networks, leaving the roofs of chambers unsupported and making them prone to collapse. The sudden formation of sinkholes in the orlando area is best illustrated by the formation of the Winter Park sinkhole on May 8, 1981. The first sign that trouble was brewing was the unusual spectacle of a tree suddenly disappearing into the ground at 7:00 p.m., as if being sucked in by an unseen force. Residents were rightfully worried. Within 10 hours a huge sinkhole nearly 100 feet (30 m) across and more than 100 feet deep had formed. it continued to grow, swallowing six commercial buildings, a home, two streets, six Porsches, and the municipal swimming pool, causing more than $2 million in damage. The sinkhole has since been converted into a municipal park and lake. more than 1,000 sinkholes have formed in parts of southern Florida in recent years, caused by the lowering of the groundwater level to accommodate residential and commercial growth in the region. many parts of the world exhibit sinkhole topography: Florida, indiana, missouri, Pennsylvania, and Tennessee in the united states, the karst regions of the Balkans, the salalah region of Arabia, southern China, and many other places where the ground is underlain by limestone. sinkholes have many different forms. some are funnel-shaped, with boulders and unconsolidated sediment along their bottoms; others are steep-walled, pipelike features that have dry or water-filled bottoms. some sinkholes in southern oman are up to 900 feet (247 m) deep pipes with caves at their bottoms, where residents obtained drinking water until recently, when wells were drilled. Villagers, mostly women, would have to climb down precarious vertical walls then back out carrying vessels of water. The bottoms of some of these sinkholes are littered with human bones, some dating back thousands of years, of water carriers who slipped on their route. Prehistoric cave art decorates some of the caves, showing that these sinkholes served as water sources for thousands or tens of thousands of years. sinkhole formation is intricately linked to the lowering of the water table, as exemplified by the Winter Park example. When water fills the underground caves and passages, it slowly dissolves the walls, floor, and roof of the chambers, carrying the limestone away in solution. When the water table is lowered by drought, by people overpumping the groundwater, or by other mechanisms, the roofs of the caves may no longer be supported, and they may catastrophically collapse into the chambers, forming a sinkhole on the surface. in Florida many of the sinkholes formed because officials lowered the water-table level to drain parts of the Everglades in order to make more land available for development. This ill-fated decision was rethought, and attempts have been made to restore the water table, but in many cases it was too late and the damage was done. many sinkholes form suddenly and catastrophi-cally, with the roof of an underground void suddenly collapsing, dropping all of the surface material into the hole. other sinkholes form more gradually, with the slow movement of loose, unconsolidated material into the underground stream network, eventually leading to the formation of a surface depression that may continue to grow into a sinkhole. The pattern of surface subsidence resulting from sinkhole collapse depends on the initial size of the cave that collapses, the depth of the cavity, and the strength of the overlying rock. Big caves that collapse can cause a greater surface effect. For a collapsed structure at depth to propagate to the surface, blocks must fall off the roof and into the cavern. The blocks fall by breaking along fractures and falling by the force of gravity. if the overlying material is weak, the fractures will propagate outward, forming a cone-shaped depression with its apex in the original collapse structure. in contrast, if the overlying material is strong, the fractures will propagate vertically upward, causing a pipelike collapse structure. When the roof material collapses into the cavern, blocks of wall rock accumulate on the cavern floor. There is abundant pore space between these blocks, so the collapsed blocks occupy a larger volume than they did when they were attached to the walls. in this way the underground collapsed cavern can fill completely with blocks of the roof and walls before any effect migrates to the surface. if enough pore space is created, minimal subsidence will occur along the surface. in contrast, if the cavity collapses near the surface, a collapse pit will eventually form on the surface. migration of a deep-collapse structure from its initial depth to the surface can take years to decades. The first signs of a collapse structure migrating to the surface include tensional cracks in the soil, bedrock, and building foundations, formed as material pulls away from unaffected areas as it subsides. Circular areas of tensional cracks may enclose an area of contractional buckling in the center of the incipient collapse structure, as bending in the center of the collapsing zone forces material together. After sinkholes form, they may take on several different morphological characteristics. solution sinkholes are saucer-shaped depressions formed by the dissolution of surface limestone and have a thin cover of soil or loose sediment. These grow slowly and present few hazards, since they form on the surface and are not connected to underground stream or collapse structures. Cover-subsidence sinkholes form where the loose surface sediments move slowly downward to fill a growing, solution-type sinkhole. Cover-collapse sinkholes form where a thick section of sediment overlies a large solution cavity at depth, and the cavity is capped by an impermeable layer such as clay or shale. A perched water table develops over the aquiclude. Eventually, the collapse cavity becomes so large that the shale or clay aquiclude unit collapses into the cavern, and the remaining overburden rapidly sinks into the cavern, much like sand sinking in an hourglass. These are some of the most dangerous sinkholes, since they form rapidly and can be quite large. Collapse sinkholes are simpler but still dangerous. They form where the strong layers on the surface collapse directly into the cavity, forming steep-walled sinkholes. Continued maturation of sinkhole topography can lead to the merging of many sinkholes into elongate valleys, and the former surface becomes flat areas on surrounding hills. Even this mature landscape may continue to evolve, until tall, steep-walled karst towers reach to the former land surface, and a new surface has formed at the level of the former cave floor. The Cantonese region of southern China's Guangxi Province best shows this type of karst tower terrain. What is the plate tectoincs connection to mt pinatubo? What type of tectonic plate movement occurs in mount pinatubo? What time of plate boundary does pinatubo occur at? What plate boundaries and earth's features led to mount pinatubo? What are the tectonics of mountain puintubo? What is the tectonic origin of this volcanic activity mount pinatuba? How long did the tectonic activity of mt pinatubo last? What plate boundary slippage caused the arthquake that erupted mt pinatubo? What type of plate of the mt pinatubo philippine eruption 1991? What caused mt pinatubo eruption tectonic plates? What plates made mt pinatubo? How did plate tectonics contribute to the volcanic eruption of mount pinatubo?